Applications are invited Online from qualified candidates through the proforma Application to be made available on Commission’s WEBSITE (www.tspsc.gov.in) to the post of Assistant Accounts Officer Gr-II, Assistant Stores Officer Gr-II and Data Processing Assistant Gr-II In Telangana State Beverages Corporation Limited in the State of Telangana. 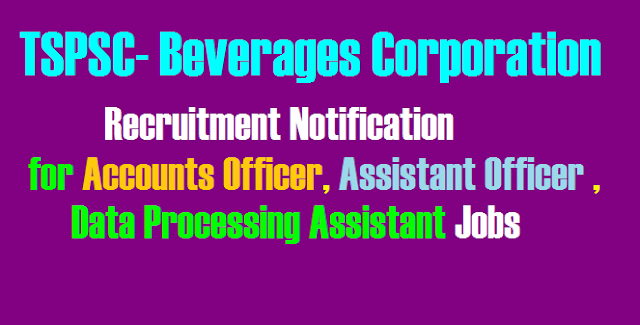 Applicants must possess the qualifications from a recognized University/ Institution as detailed below or equivalent thereto, as specified in the relevant Telangana State Beverages Corporation Service Regulations, indented by the Department as on the Date of Notification. B.Com from any University recognized by UGC, and proficiency in accounts. B.Com from any University recognized by UGC, and proficiency in Computer applications. Graduation from any University recognized by UGC and proficiency in Computer applications. (Rule- 12(1)(a)(v) of State and Subordinate Service Rules). Skill Test, Document Verification and merit list. category of candidates are exempted from payment of Examination fee. be decided by the Commission. Applicants have to choose any five (5) Centers in order of preference. The Commission however reserves the right to allot candidates to any centre other than the centre chosen by the applicant or to abolish / create a new centre for administrative reasons. Request for change of the centre will not be entertained. Fee will not be accepted after 11:59 P.M of last date for submission.